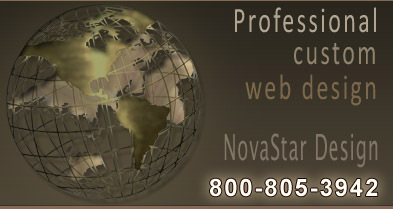 NovaStar Design is a full-service web design company specializing in custom website design and development and website marketing. Looking for a professional, experienced web design company? We’ve been turning our clients visions and dreams in to reality since 1996! We have compiled a list of terms used in Web Design business we feel may be useful to our clients. Although we do our best to explain everything in layman's terms, we feel it's important to provide you with the tools and knowledge to plan and maintain a successful website. Web Design is the art and process of creating a single Web page or entire Web sites and may involve both the aesthetics and the mechanics of a Web site's operation although primarily it focuses on the look and feel of the Web site - the design elements. A Website is a collection of web pages, images, videos or other digital assets that is hosted on one or more web servers, usually accessible via the Internet. A web page is a document, typically written in (X)HTML, that is almost always accessible via HTTP, a protocol that transfers information from the web server to display in the user's web browser. All publicly accessible websites are seen collectively as constituting the "World Wide Web". The pages of a website can usually be accessed from a common root URL called the homepage, and usually reside on the same physical server. The URLs of the pages organize them into a hierarchy, although the hyperlinks between them control how the reader perceives the overall structure and how the traffic flows between the different parts of the site. Some websites require a subscription to access some or all of their content. Examples of subscription sites include many business sites, parts of many news sites, academic journal sites, gaming sites, message boards, Web-based e-mail, services, social networking websites, and sites providing real-time stock market data. Because they require authentication to view the content they are technically an Intranet site. Web development is a broad term for any activity related to developing a web site for the World Wide Web or an intranet. This can include e-commerce business development, web design, web content development, client-side/server-side scripting, and web server configuration. However, among web professionals, "web development" usually refers only to the non-design aspects of building web sites, e.g. writing markup and coding. Web development can range from developing the simplest static single page of plain text to the most complex web-based internet applications, electronic businesses, or social network services..
Graphic designer (also known as a graphic artist and communication artist) is a professional within the graphic design and graphic arts industry who assembles together images, typography or motion graphics to create a piece of design. A graphic designer creates the graphics primarily for published, printed or electronic media, such as brochures and advertising. They are also sometimes responsible for typesetting, illustration and web design, or take a teaching position, although these specialties may be assigned to specialists in various graphic design occupations. A core responsibility of the designer's job is to present information in a way that is both accessible and aesthetic. A web site is a collection of information about a particular topic or subject. Designing a web site is defined as the arrangement and creation of web pages that in turn make up a web site. A web page consists of information for which the web site is developed. A web site might be compared to a book, where each page of the book is a web page. The content: the substance, and information on the site should be relevant to the site and should target the area of the public that the website is concerned with. The usability: the site should be user-friendly, with the interface and navigation simple and reliable. The appearance: the graphics and text should include a single style that flows throughout, to show consistency. The style should be professional, appealing and relevant. The visibility: the site must also be easy to find via most, if not all, major search engines and advertisement media. A web site typically consists of text and images. The first page of a web site is known as the Home page or Index. Some web sites use what is commonly called a Splash Page. Splash pages might include a welcome message, language or region selection, or disclaimer. Each web page within a web site is an HTML file which has its own URL. After each web page is created, they are typically linked together using a navigation menu composed of hyperlinks. Faster browsing speeds have led to shorter attention spans and more demanding online visitors and this has resulted in less use of Splash Pages, particularly where commercial web sites are concerned. Once a web site is completed, it must be published or uploaded in order to be viewable to the public over the internet. This may be done using an FTP client. Once published, the web master may use a variety of techniques to increase the traffic, or hits, that the web site receives. This may include submitting the web site to a search engine such as Google or Yahoo, exchanging links with other web sites, creating affiliations with similar web sites, etc. Web site design crosses multiple disciplines of information systems, information technology and communication design. The web site is an information system whose components are sometimes classified as front-end and back-end. The observable content (e.g. page layout, user interface, graphics, text, audio) is known as the front-end. The back-end comprises the organization and efficiency of the source code, invisible scripted functions, and the server-side components that process the output from the front-end. Depending on the size of a Web development project, it may be carried out by a multi-skilled individual (sometimes called a web master), or a project manager may oversee collaborative design between group members with specialized skills. A static website is one that has web pages stored on the server in the same form as the user will view them. It is primarily coded in HTML (Hyper-text Markup Language). A Static website is also called a Classic website, a 5-page website or a Brochure website because it simply presents pre-defined information to the user. It may include information about a company and its products and services via text, photos, Flash animation, audio/video and interactive menus and navigation. This type of website usually displays the same information to all visitors, thus the information is static. Similar to handing out a printed brochure to customers or clients, a static website will generally provide consistent, standard information for an extended period of time. Although the website owner may make updates periodically, it is a manual process to edit the text, photos and other content and may require basic website design skills and software. In summary, visitors are not able to control what information they receive via a static website, and must instead settle for whatever content the website owner has decided to offer at that time. (SEO) is the process of improving the volume and quality of traffic to a web site from search engines via "natural" ("organic" or "algorithmic") search results. Typically, the higher a site's "page rank" (i.e, the earlier it comes in the search results list), the more visitors it will receive from the search engine. SEO can also target different kinds of search, including image search, local search, and industry-specific vertical search engines. As an Internet marketing strategy, SEO considers how search engines work and what people search for. Optimizing a website primarily involves editing its content and HTML coding to both increase its relevance to specific keywords and to remove barriers to the indexing activities of search engines. The acronym "SEO" can also refer to "search engine optimizers," a term adopted by an industry of consultants who carry out optimization projects on behalf of clients, and by employees who perform SEO services in-house. Search engine optimizers may offer SEO as a stand-alone service or as a part of a broader marketing campaign. Because effective SEO may require changes to the HTML source code of a site, SEO tactics may be incorporated into web site development and design. The term "search engine friendly" may be used to describe web site designs, menus, content management systems and shopping carts that are easy to optimize. A web hosting service is a type of Internet hosting service that allows individuals and organizations to provide their own website accessible via the World Wide Web. Web hosts are companies that provide space on a server they own for use by their clients as well as providing Internet connectivity, typically in a data center. Web hosts can also provide data center space and connectivity to the Internet for servers they do not own to be located in their data center, called colocation. File Transfer Protocol (FTP) is a network protocol used to transfer data from one computer to another through a network such as the Internet. A Web search engine is a tool designed to search for information on the World Wide Web. Information may consist of web pages, images, information and other types of files. Some search engines also mine data available in news books, databases, or open directories. Unlike Web directories, which are maintained by human editors, search engines operate algorithmically or are a mixture of algorithmic and human input. Web analytics is the measurement, collection, analysis and reporting of internet data for purposes of understanding and optimizing web site usage. There are two categories of web analytics; off-site and on-site web analytics. Off-site web analytics refers to web measurement and analysis irrespective of whether you own or maintain a website. It includes the measurement of a website's potential audience (opportunity), share of voice (visibility), and buzz (comments) that is happening on the Internet as a whole. On-site web analytics measure a visitor's journey once on your website. This includes its drivers and conversions; for example, which landing pages encourage people to make a purchase. On-site web analytics measures the performance of your website in a commercial context. This data is typically compared against key performance indicators for performance, and used to improve a web site or marketing campaign's audience response. Historically, web analytics has referred to on-site visitor measurement. However in recent years this has blurred, mainly because vendors are producing tools that span both categories. PageRank is a link analysis algorithm used by the Google Internet search engine that assigns a numerical weighting to each element of a hyperlinked set of documents, such as the World Wide Web, with the purpose of "measuring" its relative importance within the set. The algorithm may be applied to any collection of entities with reciprocal quotations and references. “PageRank relies on the uniquely democratic nature of the web by using its vast link structure as an indicator of an individual page's value. In essence, Google interprets a link from page A to page B as a vote, by page A, for page B. But, Google looks at more than the sheer volume of votes, or links a page receives; it also analyzes the page that casts the vote. Votes cast by pages that are themselves "important" weigh more heavily and help to make other pages "important"." In other words, a PageRank results from a "ballot" among all the other pages on the World Wide Web about how important a page is. A hyperlink to a page counts as a vote of support. The PageRank of a page is defined recursively and depends on the number and PageRank metric of all pages that link to it ("incoming links"). A page that is linked to by many pages with high PageRank receives a high rank itself. If there are no links to a web page there is no support for that page. Link popularity is a measure of the quantity and quality of other web sites that link to a specific site on the World Wide Web. It is an example of the move by search engines towards off-the-page-criteria to determine quality content. In theory, off-the-page-criteria adds the aspect of impartiality to search engine rankings. Link popularity plays an important role in the visibility of a web site among the top of the search results. Indeed, some search engines require at least one or more links coming to a web site, otherwise they will drop it from their index. Search engines such as Google use a special link analysis system to rank web pages. Citations from other WWW authors help to define a site's reputation. The philosophy of link popularity is that important sites will attract many links. Content-poor sites will have difficulty attracting any links. Link popularity assumes that not all incoming links are equal, as an inbound link from a major directory carries more weight than an inbound link from an obscure personal home page. In other words, the quality of incoming links counts more than sheer numbers of them.